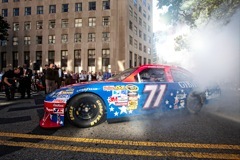 It’s not every day you catch a NASCAR driver burning rubber on Vermont Avenue just a block from the White House. Today, as part of an event to promote the Post-9/11 GI Bill, 71-car driver Landon Cassill got to do a burnout in front of the Veterans’ Administration building on Vermont Ave. The 71-car will feature ads for the Post-9/11 GI Bill’s My Story campaign, focused on demonstrating the benefits of the Post-9/11 GI Bill. Personally, I love that they added this to the road-tattoo block of Vermont, almost as a “signature” to the previous “art” that was put there. This entry was posted in: Sports Fix, The Daily Feed, The District, WTF? !